So, by the end of day one we arrived in a small village called Bobino with a chapel and a school floor where we were taken in to have a meal of buckwheat porridge and vegetables and tea and a very early night spent comfortably enough in my sleeping bag on the floor. “Wonderful news,” Arkady the student said to me, “you have a blessing to carry one of the banners—put this on,” as he handed me a sticharion at 3 AM the next morning. So there I was, a strange Englishman walking at the front of the procession, carrying a banner of the Saviour through Holy Russia. After three days on the march we arrived at the river where the icon was discovered where a festive array of stalls selling things to eat and souvenirs to buy stretched from the monastery church towards the bank of the river. The usual huge vats of buckwheat porridge were available for the pilgrims and at 10 AM the Patriarch arrived to celebrate the Liturgy in an outdoor pavilion. After lunch—a bath in the river, and a relaxed afternoon. Then at 2 AM the following morning, after a service in the Church, we were heading back. Two days later, in the gentle rain we walked back into the monastery at Kirov for the last service and tearful farewells to the strangers who had become friends. And after all my anxiety, and worry about my ability to walk that far, fear of not coping and the possibility of blisters? It was simply one of the most wonderful weeks of my life. Not only that I was moved by the devotion and love of the pilgrims, of their courage and deep happiness despite all the difficulties, but that something else had changed in me—a deep joyful realization that if my life of faith is a journey, then I am not traveling alone, but that supported and encouraged and loved even by people I scarcely knew, we are on this road together. Despite all life’s anxieties and frustrations, with prayer and even the smallest grain of faith, it will be alright. As I walked the last mile, glad that the rain was disguising my tears, I felt triumphant and deeply thankful. I pray that I will remember this lesson as I go through the remainder of my journey. 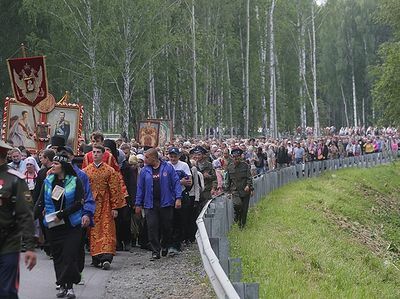 I pray also that I might return to walk Russia’s Holy Road again. The guest of today’s program is James Evans, an Orthodox Englishman. 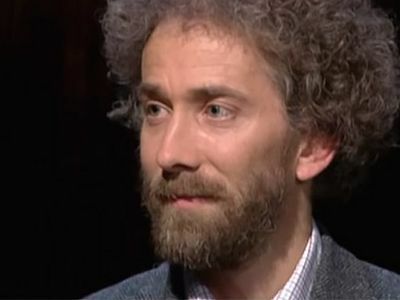 He will tell us why he prefers to live in Russia rather than in England, what he gets from singing in the Orthodox church and how his journey to Orthodoxy began. Why do Russians insist on the name “Holy Russia”? 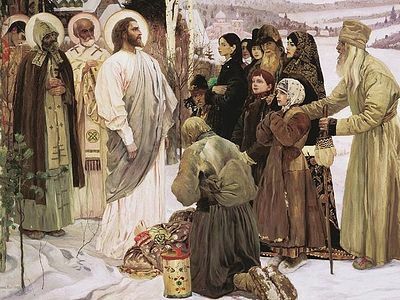 Nicholas Kotar Why do Russians insist on the name “Holy Russia”? Wonderful article! Thank you, Alexander Groves!